From today’s Hagerstown (MD) Herald-Mail Newspaper. This is an excerpt–to read the entire article click here. HAGERSTOWN — For years, Andrew E. “Andy” Auxt could be spotted in the corner of the gymnasium at Heritage Academy varsity basketball games, armed with his lawn chair and a cushion, according to his daughter, Sharon Auxt White. Auxt usually was accompanied by his wife of nearly 70 years, Mary Jane Auxt, White said Thursday. The Auxts “were great encouragers. Every time you walked past, they’d always have something encouraging to say,” Kidd said. 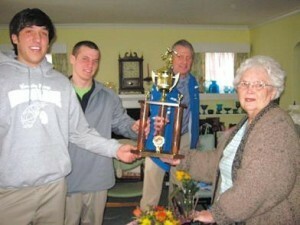 On Thursday, 16 days after Andy Auxt’s death, Kidd picked up some of his players and they went to the Auxt family residence to present to the widow a 2 1/2-foot trophy the team won in last week’s Mason Dixon Christian Conference Tournament. “We wanted to let her know how much he meant to us,” Kidd said. “Encourager” was an appropriate word to describe her father, White said.